PhD student Andrea Ippolito improves health care through engineering, entrepreneurship, and systems design.For as long as she can remember, Andrea Ippolito has known that she wanted to be an engineer. What she couldn’t have predicted was what, precisely, the scope and scale of her work would turn out to be. 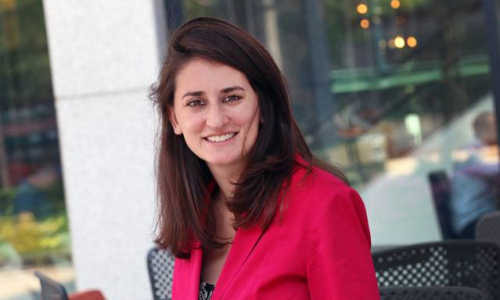 Ippolito began her career at Boston Scientific after getting bachelor’s and master’s degrees in biomedical engineering from Cornell University. Back then, she worked on drug-coated medical devices and studied how they interfaced with the surrounding cells of a patient. She liked working on those systems, but also began fostering an interest in health care engineering on a more macroscopic scale: Rather than one device, one human, or one interface, Ippolito wanted to look at the entire health care ecosystem. “I was drawn into the strategy of the technology as well as the technology,” she says. It was that newfound fascination that brought her to the MIT System Design and Management (SDM) program in 2011, and then to the Engineering Systems Division (ESD) PhD program in 2013. Today, Ippolito is a second-year graduate student in ESD, expecting to earn her PhD in 2017. Ippolito’s initial research focused on the use of “telehealth” — treatment via video chat — and in particular on the treatment of post-traumatic stress disorder (PTSD) within military health systems. The problem is that when members of the military return from deployment, they often do so in large numbers. As a result, the health care providers that administer PTSD screenings are overwhelmed with work. Telehealth treatment could make it easier to spread out workloads for overall better care and more predictable scheduling. It could also enable the standardization of certain health care best practices, a boon for a complex health care network like that of the U.S. military. Earlier this fall, Ippolito was named by the White House and General Services Administration as a Presidential Innovation Fellow, allowing her to work directly with the Department of Veterans Affairs to improve some of its processes. As her research progresses, Ippolito continues to focus on how technology can enable a better, cheaper, and more navigable health care system. Last fall, she worked on a project evaluating the Massachusetts Health Information Exchange, the network by which patient records are shared among health care providers and other members of the health care ecosystem. “I got a great bird’s-eye view of all the different entities and got to really understand the complexity of our health care system,” she says. Ippolito has admired the practices of scientists and engineers since she was a young girl. It’s in her blood: Her father was a mechanical engineer, and her mother was an electrical engineer who designed space suits. During recess while in grade school, Ippolito would play on the playground like the other kids — but her favorite spot was a big rock in the schoolyard, which she would pretend was her own personal laboratory. In sixth grade, she dressed up as astronaut Sally Ride for Halloween — no doubt inspired, in part, by her mother’s work — and did most years after that. “I was really lucky I had such a positive role model in my mom,” Ippolito says. Ippolito always wanted to go to space camp, too, but her mother said it was too expensive — “which it sort of is, for a little kid for five days,” she concedes. So after she graduated from MIT SDM, she and her mother celebrated by finally going to space camp. Ippolito might not have ended up in the field of health care were it not for several biology teachers and mentors she encountered during high school in Burlington, Mass. In particular, she recalls attending a national leadership forum on medicine one summer in Philadelphia. At the forum, she met a biomedical engineer from Shriners Hospital for Children who ran a “gait lab” — attaching sensors to kids with motor disabilities to study and try to improve their gaits. Ippolito was fascinated, and asked the engineer about his work. That was the first time she heard the term “biomedical engineering”; several years later, she had a degree in the discipline from Cornell. Ippolito is working on improving health care systems through entrepreneurship as well as her research. She’s a co-lead of the MIT student organization Hacking Medicine, whose goal is to apply agile, disruptive thinking to big problems in the health care sphere. So far, Hacking Medicine has held nearly 20 hackathons in the United States, Spain, Uganda, and India. Often, these health care hack days spark new startups. One of Ippolito’s favorites is PillPack, an online pharmacy that provides medications pre-sorted into packs grouped by when the medication should be taken. PillPack has raised nearly $13 million in funding. Ippolito’s own startup, Smart Scheduling, also resulted from a Hacking Medicine event. Smart Scheduling was born from the realization that patient no-shows are a giant inefficiency, and a burden on doctors. Doctors fight no-shows by overbooking patients, which is not ideal because if patients do show up, there’s not enough room to fit them in the schedule. Smart Scheduling uses machine learning to identify potential no-shows to take better care of patients by providing better appointment access and schedule flexibility. Overall, Ippolito is applying every tool in her toolkit — entrepreneurship, system design, and engineering expertise — to her obsession with improving the health care ecosystem. “I just think that being an engineer in health care, there’s no better place to be to make an impact,” she says. The above story is based on materials provided by MIT News Office.